Ken Banks is the creator of FrontlineSMS – a software that is being used by The United Methodist Church to build communications in regions where the Internet and computers are lacking. 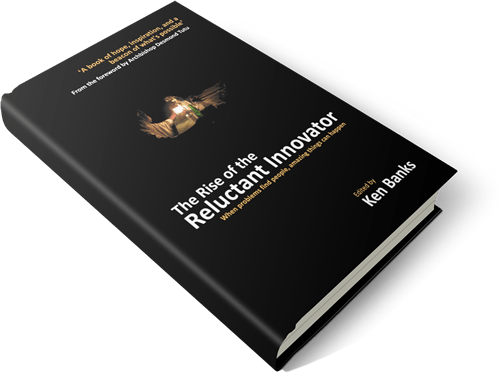 Ken recently produced a book, “The Rise of the Reluctant Innovator” that is a great read for anyone seeking to solve the problems found in developing countries. “For such a time as this” is a reference from Scriptures that describes one who, situated in the midst of a problem, was uniquely poised to solve it. “The Rise of the Reluctant Innovator” is filled with unique stories of world problems that, when experienced by individuals with the right gifts and passions, began taking a different restorative shape. Some of these stories are continuing to unfold in United Methodist settings – particularly Ushahidi for mapping beyond the U.S., Medic Mobile for mhealth, and the Solar Suitcase – which I hope we deploy in 2014. If you are seeking inspiration for the new year, working in international development, or ICT4D, add this book to your reading list. Ken will be a keynote speaker at United Methodist Communication’s ICT4D conference in September 2014…I bet he’d be happy to sign your copy! Thanks, Ken, for again bringing to light the essence of synergistic creativity that can truly change the world. This entry was posted in Book Review and tagged ICT4D, International Development, m4d. Bookmark the permalink.